Erika Oliver, a 2013-2014 VIA Fellow, founded an Emory chapter of Building Tomorrow, an organization that mobilizes communities to help build schools in Africa. 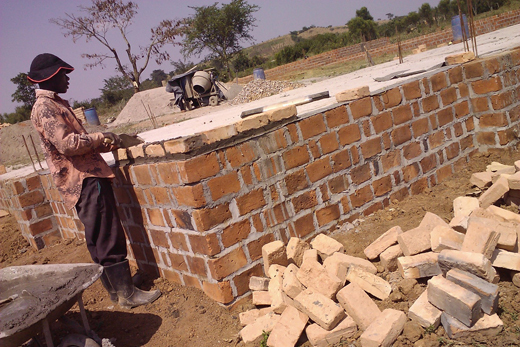 Oliver coordinated fundraisers to finance the construction of schools in rural Uganda, like the one being built in this photo. The application deadline for Fall 2015 VIA Fellows is Saturday, April 4. When Brian Fuller found his way to Emory lecturer Christine Ristaino’s office three years ago, he didn’t need help pinpointing his goals. Fuller, 13C, had already defined his dream: Create a curriculum for middle school and high school students based upon self-awareness, self-efficacy and self-esteem. As it happened, Ristaino, who teaches Italian, shared an interest in educational reform and was offering a class on the Reggio Emilia approach to learning, an educational philosophy developed in Italy after World War II. Together, they agreed to partner for an intensive year of independent study, researching self-esteem and its affects on behavior and academics in children with the goal of helping Fuller create the curriculum “that was just sitting inside of him,” Ristaino recalls. Today, Fuller is the Philadelphia program director for The Dream Program, an agency that builds mentoring partnerships between college students and children in low-income housing developments. That curriculum he developed while at Emory? He’s already used elements of it in his current job and is now in talks about piloting it with other organizations in New York and Philadelphia. Three years later, what began as a partnership to help germinate one student’s dream has grown into Vision in Action (VIA), a for-credit, year-long program that pairs Emory students who have a vision for social change with faculty experts who can help them realize those ideas, from start to finish. Offered through Emory’s Office of Student Leadership and Service (OSLS), students who are accepted into the program as VIA Fellows begin meeting weekly for independent study with an assigned faculty member throughout the fall semester, says Ristaino, who co-directs the program with Lisa Kendall, interim director for community engagement for the OSLS. “They start by figuring out the academic side to their project, developing a syllabus together, researching their topic and creating a project that meets their interests,” explains Ristaino. During spring semester, students receive funding — between $250 and $750 — to put proposals into action. Students also meet as a cohort to discuss shared experiences. “As a group, each fellow supports one another to reach new heights, and in the process, realizes the journey is just as important,” Kendall says. In order to apply, VIA Fellows must have either already participated in The LeaderShape Institute — a week-long, intensive leadership development program offered through OSLS that allows 60 Emory students to help create a vision for a more just, caring and thriving world and learn leadership skills to help facilitate that vision — or they must sign up to take it during the spring semester they are enrolled in the program. After LeaderShape, students may then apply to Vision in Action for additional faculty mentorship and course credits while working toward implementing their vision, says Matt Garrett, interim senior director of the Center for Student Leadership and Community Engagement. Part of the joy of working with the VIA Fellows has been the chance to see where their ideas will lead, Ristaino says. Last year, student projects inspired the creation of “The Good Life” speaker series, offered through Flourish Emory; an educational and support program for teen mothers, now being adopted by a Florida high school; and a campus fundraiser that was used to help construct classrooms in rural Uganda. “I was drawn to Vision in Action because I liked the idea that we could implement a vision of our choice, with the help of faculty and some financial backing,” says Erika Oliver, a 2013-2014 VIA Fellow who founded an Emory chapter of Building Tomorrow, an organization that mobilizes communities to help build schools in Africa. Working with Sam Cherribi, a senior lecturer in sociology who researches development issues in low-income countries, Oliver coordinated on-campus events that raised more than $6,700 to construct classrooms in the small village of Kisaluwoko, Uganda, among others. This year, continued fundraising has seen total donations climb to more than $11,000, reports Oliver, a senior majoring in neuroscience and behavioral biology, who will begin medical school this fall. This year’s VIA Fellows have already yielded impressive results, Ristaino says. Last month, the VIA program helped launch the debut of “Black at Emory University: Activism in a ‘Post-Racial’ Society,” a student-organized conference intended to offer a continuation of Emory’s “blacktivism” movement, which drew about 70 participants. The idea for the conference came from Casidy Campbell, a 2014-2015 VIA Fellow who spent this academic year developing the idea for the gathering, which had support from OSLS and Emory’s Black Student Alliance. Campbell was paired with faculty mentor Nagueyalti Warren, professor of pedagogy in the Department of African American Studies. “From a faculty perspective, it was a wonderful experience,” Warren says. Projects arise from unexpected moments and places. Shanice Kellman, a junior majoring in sociology and media studies, was inspired to apply for a 2014-2015 VIA Fellowship after observing her 6-year-old cousin playing with dolls. Through VIA, she’s had the chance to do just that, working with Carlton Mackey, director of Emory’s Ethics and the Arts program, adjunct professor of African American studies, and curator of the multi-media project, “Beautiful in Every Shade” — an experience made richer by readings that have deepened her understanding of class, race and media.